Student volunteers at the University of Illinois Springfield collected over 7,000 pounds of food during the annual Trick or Treat for Canned Goods competition on Halloween night. Fifteen teams, for a total of about 120 of UIS students, canvassed assigned Springfield neighborhoods collecting non-perishable food items. The teams visited the neighborhoods before Halloween, distributing door hangers that explained the project. “We’ve been doing Trick or Treat for Canned Goods for three years now and it’s been very successful. Each year, I feel like we gradually become better at it,” said Brittany Young, a sophomore sociology/anthropology major. The canned food drive is part of the UIS Holiday Stars Project, a campus-wide service initiative giving focus to UIS’ efforts to make a difference in the local community during the holiday season. Sophomore English major Allison Duncan has walked door-to-door for the past two years. She’s amazed by the response from the community and feels like she’s giving back. Prizes were awarded to the top three student groups collecting the most food. The top groups included the first place Lamda Pi Eta Communication Honor Society with 1,131 pounds, the second place UIS Women’s Basketball team with 966 pounds, and the third place Christian Student Fellowship with 726 pounds. The Central Illinois Foodbank distributes nearly 8 million pounds of food annually to over 160 food pantries, soup kitchens, residential programs and after-school programs in a 21 county region. The foodbank is a member of Feeding America, the nation's largest domestic hunger relief organization, and is a United Way certified agency. More information is available at www.centralilfoodbank.org. For more information on the UIS Holiday Stars Project, contact Brittany Elder, volunteer services coordinator, by email at belde2@uis.edu, or go to www.uis.edu/holidaystars. The UIS community showed off their Prairie Star pride during Homecoming 2011. The theme for this year’s celebration, which was held Oct. 10-15, was “We Bleed Blue”. Participants packed the campus for the annual Homecoming Parade, BBQ and the men’s and women’s soccer games on Friday, Oct. 14. Saturday featured the annual 5K Run/Walk, service event, luncheon, and more. The U-Help, I-Help Springfield Service Event was held at St. Joseph’s Home in Springfield. It’s UIS’ traditional way to end the week by giving back to the community. Members of the Prairie Stars 1986 NAIA Men's Soccer National Championship team were honored during the Saturday luncheon. The day ended with the annual UIS Students vs. Alumni/Faculty/Staff Basketball game. Earlier in the week a Homecoming Pep Rally was held, followed by Spirit Games throughout the week, a homecoming dance and much more. John Martin, assistant professor of Astronomy and Physics at the University of Illinois Springfield has been named University Scholar for 2011. He is the only UIS faculty member chosen for this award honoring and rewarding outstanding teachers and scholars at the three U of I campuses. In astronomy, Martin studies supernova imposters and the end stages of the most massive stars. He was recently awarded a $62,096 grant over three years from the National Science Foundation to study Eta Carinae, the nearest supernova imposter. In addition to his research, he is an excellent example of the teacher-scholar model in action at UIS. “While still at a relatively early stage in his academic career, he has nonetheless been a very productive scholar, and his research has already generated significant recognition within his field,” said Lynn Pardie, UIS interim vice chancellor for academic affairs and provost. Martin has had articles published in several top-tier journals in his field and has delivered numerous professional presentations on his research in professional and academic venues. His work has also been featured in widely circulated mainstream publications, including the magazine Astronomy. In addition to course development, teaching, research, and professional service activities both on and off-campus, Martin directs the campus’ research observatory. He is known as an enthusiastic and energetic champion of astronomy, constantly striving to encourage both student and public interest in the field, and he is a mentor of student research. Martin’s educational outreach activities include hosting public observatory Star Parties at UIS, which are held in the spring and fall each year. “As noted in letters from academic peers, the quality of Martin’s scholarship and research achievements thus far are praiseworthy and exemplify the ideals of the University Scholar award,” said Pardie. Martin holds a B.A. in Astrophysics from the University of Virginia and a Ph.D. in Astronomy from Case Western Reserve University. As University Scholar, he will receive $10,000 a year for three years to support research and other scholarly activities. Faculty do not apply for this award; they are nominated by their peers. A committee of senior faculty makes the final selection. 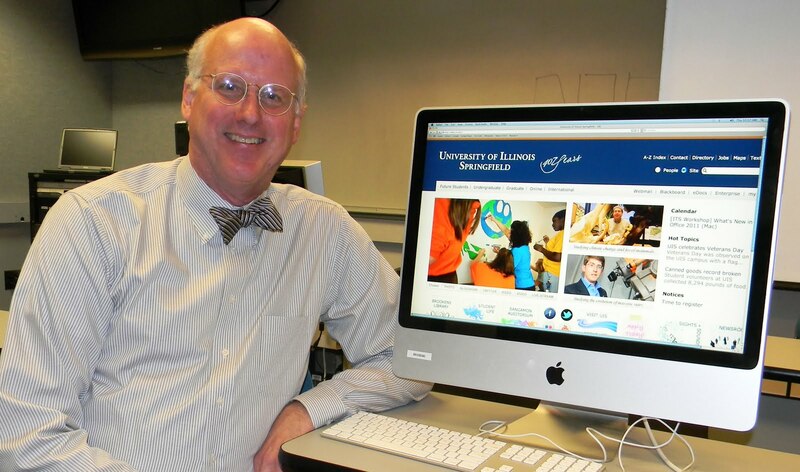 Dr. Michael Cheney, professor of communication at the University of Illinois Springfield, is being honored with a national Excellence in Online Teaching Award. The Sloan Consortium (Sloan-C) award is one of the highest honors presented by the group, which is comprised of fellow online educators. “I am very honored to receive this award. UIS is known for its excellence in online education and I am happy to contribute to that reputation through my work,” Cheney said. Cheney is known for his popular online courses, which include The Beatles: Popular Music and Society, Political Communication and Writing for Public Relations. In 2010, Cheney’s “Unit 1: Beatles as Mosaic” podcast was the second most downloaded podcast on iTunes U for several weeks. The series was also listed in the “Noteworthy” section of iTunes U.
Cheney began using three to four minute podcasts during the Fall Semester of 2005. The weekly podcasts include lectures and supporting material. Students use Apple’s iTunes software to listen to the recordings. The service is offered free of charge to both students and the university. “I use podcasts in the class as a way to complement the material students are already studying and to provide them with poignant references and information to enhance their understanding of the course,” Cheney said. 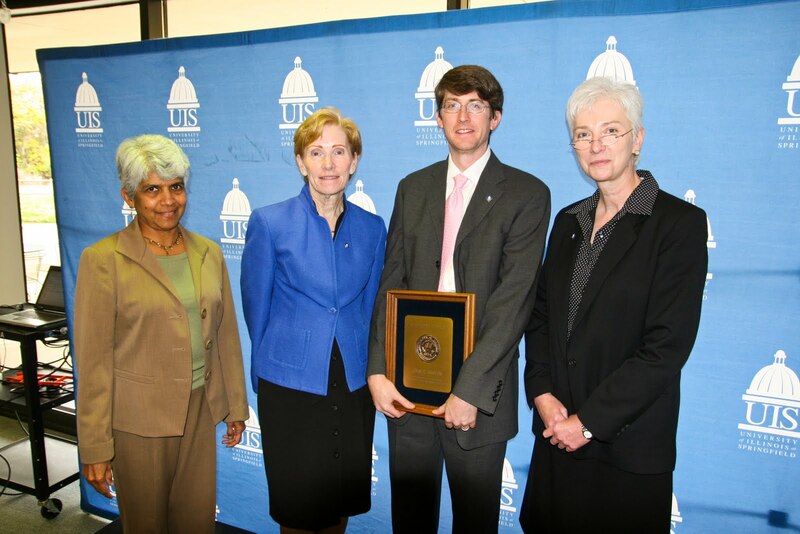 Sloan-C awarded three UIS faculty members Outstanding Achievement Awards in 2002, 2003 and 2006. No other university in the country has received more outstanding achievement awards. 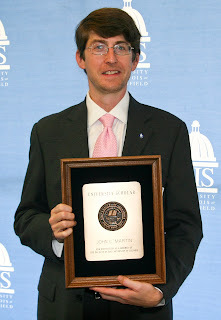 UIS was recognized with an Institution-Wide Excellence Award in 2007 and the Ralph E. Gomory Award for Quality Online Education in 2008. In 2010, Ray Schroeder, director of the UIS Center for Online Learning, Research, and Service (COLRS) was awarded the inaugural A. Frank Mayadas Leadership Award. The UIS Teacher Leadership Program was also honored the same year with the Outstanding Online Program Award. The Sloan Consortium is an institutional and professional leadership organization dedicated to integrating online education into the mainstream of higher education, helping institutions and individual educators improve the quality, scale, and breadth of education. Membership in Sloan-C provides knowledge, practice, community, and direction for educators. Originally funded by the Alfred P. Sloan Foundation, it is now a non-profit, member sustained organization. The Excellence in Online Teaching Award will be presented to Cheney during the 17th-Annual International Conference on Online Learning: Online Teaching, Learning and Research in the New Media Ecology, in Orlando, Florida, Thursday, Nov. 10, 2011. For more information, contact Ray Schroeder at 217/206-7531 or email rschr1@uis.edu. The initial seeds of the University of Illinois Springfield's new licensing agreement with Strategic Marketing Affiliates have been planted, and for the first time, Prairie Star athletics merchandise is being sold in a local retail store. Scheels, an all-sports mega store that opened in Springfield last spring, is now stocking five versions of UIS short sleeve t-shirts, one edition of a long sleeve t-shirt and a hooded sweatshirt. Each of the UIS items available is from the Nike line of athletics apparel. Scheels is located at 3801 South MacArthur Boulevard in Springfield.